Everest Base Camp – M and S Speak! Guest bloggers. It did all start in 1991. Only one of our now four children had been born. She (A) spent much of her time in a plastic contraption that we called her rocket seat — a plastic rocker with a foam insert and a carrying handle that proved very useful for lugging her around to all the restaurants we still planned to go to with our good friends M and S. The fact we were 29 and 30 and found ourselves with an infant offspring was not about to deter us. As the years went by and the offspring expanded to include three others, we four parents found ourselves in high risk environments – such as a fondue restaurant with four under 8 year olds – with hot oil, fire and long sharp forks – and various other and sundry similar problems and situations. They are the subject of another blog post – or possibly even another website. But throughout it all was always what we used to call our travel fantasies. It could be Vietnam, New Zealand, wherever. Just something more than New Smyrna Beach or – heaven forbid- the Outer Banks. We called it travel p**n – the fulfillment of our travel fantasies – but I’m concerned WordPress and Facebook will block the phrase of what we actually called it. Just understand – it was supposed to be the ultimate escape and self realization. Travel po**n kept us going through many a career shift, stressful work situation and the other vagaries of life in the ’90s and ’00s. J nodded emphatically as he picked up the conversation thread from MR. As always, J’s contribution focused on the technical specifications. “It’s all trekking. There’s no climbing, so no ropes or crampons. We go alongside the Khumbu Glacier, not across. Highest we get is only 18,000 feet at Kala Pattar—that’s the best views of Everest. Kala Pattar is steep and there’s some scree. But you should be able to make it! “Just leave me behind,” S called out, only half in jest. He was sitting on a rock, head bent down, one arm stretched in front of him, palm facing out. It was the universal signal of defeat. We had updated the wills before we left but our Nepalese guide, Z, wasn’t having anything to do with S dying. “You have to keep moving, S. It’s not good to sit too long at this altitude.” I caught up to where S had planted himself. It wasn’t like I was moving any faster. Z exhorted both of us with the now familiar, “Tomorrow will be easier.” Z told us things that weren’t always 100% true. Like “rest days” were anything but. Turns out every day was hard and “rest days” (a/k/a acclimatization days) were the hardest! “We did it” began long before we were captured, smiling but completely, utterly spent, in the photo taken at Base Camp. “We did it” began years ago at that very first meal with MR & J talking about how, one day, after the kids were grown, we would go on a “couples vacation.” Until this year, that continuing conversation had yielded only a few extra pounds, a shared condo in St. Augustine for the Gentlemen of the Road concert, and a long weekend in Iceland functioning as something like cold-weather gear crash dummies for one of MR and J’s upcoming summit attempts. “We did it” included: going to a gym to attempt to regain something resembling good shape (and updating the wills just in case); buying a ton more gear than MR and J let on would be required; flying twice as far as we had ever flown; trekking ten times farther than we had ever hiked—and that was twenty years before; sharing close quarters and more about our bodily consumption and elimination than we were comfortable; and worrying that we might end up ruining someone else’s trip of a lifetime by succumbing to altitude sickness or injury. We did it” also included: being graciously welcomed into the homes and monasteries of people from a rich and vibrant culture; sharing the trail and tea house conversations with travelers from around the world; getting, if not to the top of the world, then pretty close; beating back the demons that taunt us as we age with the bold statement that we’re not dead, yet; discovering that friendship can survive the trek to Everest Base Camp; and, having taken every step together as a couple, finishing the last, longest, hardest day together. Our marriage is the stronger for it. MR and J were right. We could definitely do this! It felt as though we’d already had a full day of activity – after all, we’d just peered at Everest from 18,200 feet at the summit of Kala Pattar – but we had hours of trekking ahead of us. After breakfast in Gorak Shep, we headed off to Pheriche, via Lobuche, where we had stayed two nights ago. We had lunch at the same tea house – the Oxygen Altitude. Such an appropriate name – M and S suffering a little bit – sometimes the way down is actually harder than the trek up. 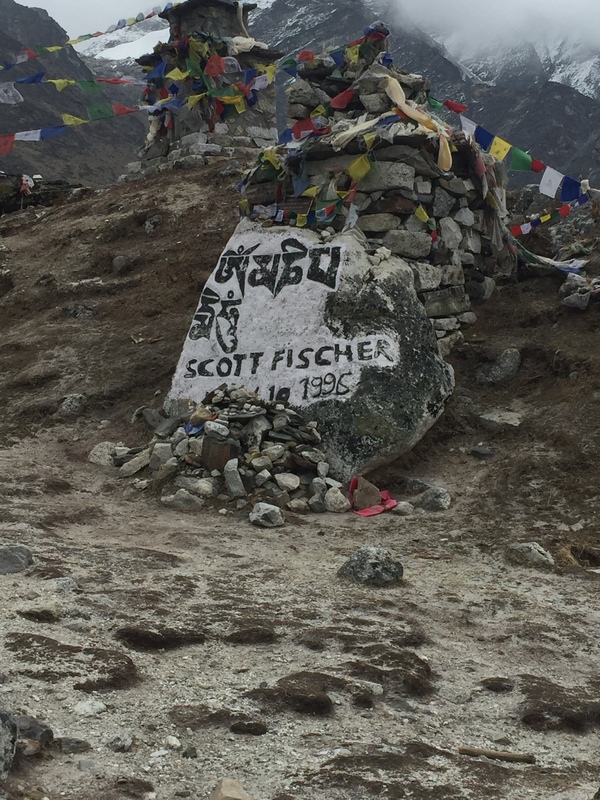 After lunch in Lobuche, we traversed again past the memorials to the dead Everest trekkers (this time getting a photo of the one in honor of Scott Fischer – after all, his old company, Mountain Madness, has been responsible for a lot of our adventures), and then down what had been a very long uphill on the way to EBC. After a bit, we made a right turn and headed into previously unhiked areas toward Pheriche. We descended into a wide flat valley with spring grasses and flowers sprouting up. The monsoon was starting early this year, and we experienced a bit of hail, followed by rain. The wind picked up, and we marched along stoically, picking our way amid puddles and piles of yak dung. We finally reached the village of Pheriche and our abode for the night, the Himalayan Hotel. It was the nicest place we had stayed for a while. Each room had its own bathroom and there was a huge dining room. I had dahl bat for dinner. J and I were both exhausted after climbing Kala Pattar and then hiking five plus hours mostly in rain. But we were at a lower altitude and it’s amazing how well you can sleep lower than 16,000 feet – especially with an en suite bathroom. I awoke without a headache for the first time in a while. For me, at least, altitude just does that. You learn to live with a low grade headache each morning – but two ibuprofen and two cups of coffee typically take care of it. We took our time and finally departed about 10. There was a lot of downhill and then up along the side of the valley with the milky river below. Stopped for some bathroom breaks at various small villages; we were moving back into village culture. Mani stones and stupas were the order of the day again. At the Wind Horse Lodge – the elderly owners sat outside in the sun. The man had a mala in one hand and an individual prayer wheel in the other – as he spun it the mala beads slipped through his fingers, effortlessly counting his prayers. His wife wore the traditional apron over her brown skirt – topped by the ubiquitous down jacket that everyone wore. 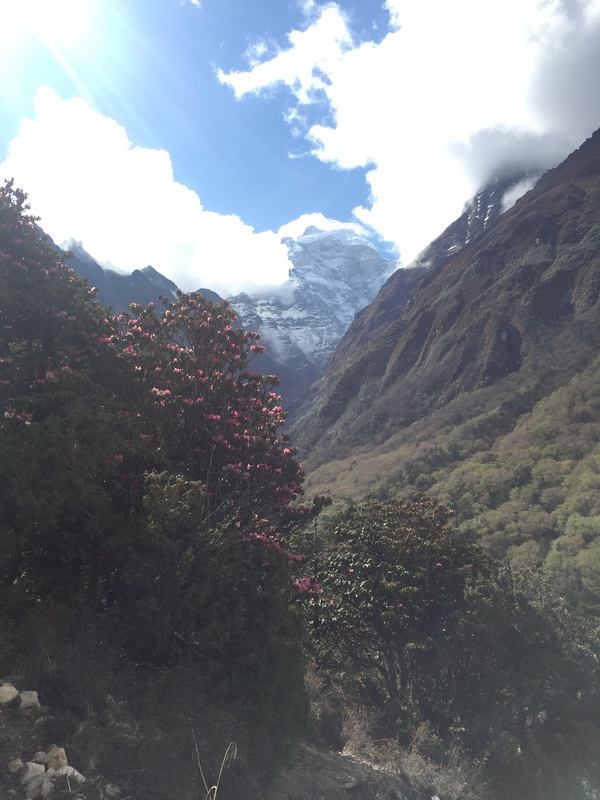 This time, instead of Upper Pangboche (home of the flying monk – recounted in Everest Base Camp Trek – Tengboche and Dingboche (or Lost Horizons)) we went through Lower Pangboche. It was an active little village, with juniper incense burning outside many of the tiny shops. By now blisters were running rampant and I was the cause of the next stop for foot care issues. We had descended to the tree line now, and wild purple iris were starting to reappear. We crossed the river a couple of times, and then made our way up a long uphill through the rhododendron forest back to the placid setting of Tengboche. It truly was a Shangri La moment, and even more pink and purple spring flowers had bloomed since we were last here. We had lunch and hung out in the dining room, watching the grey mist settle in over the grazing cows and horses. Despite this, a group of monks in their crimson robes made their way across the meadow into the neighboring field for an energetic game of soccer. We did nothing so energetic. Instead, our little hiking group engaged in a lively game of snakes and ladders on one of the many board games in the dining room. The next day we had to make our way to Namche. We’d walked this path before. But it looked totally different from the opposite direction. I think this is possibly the most beautiful part of the whole trek – and possibly any trek. 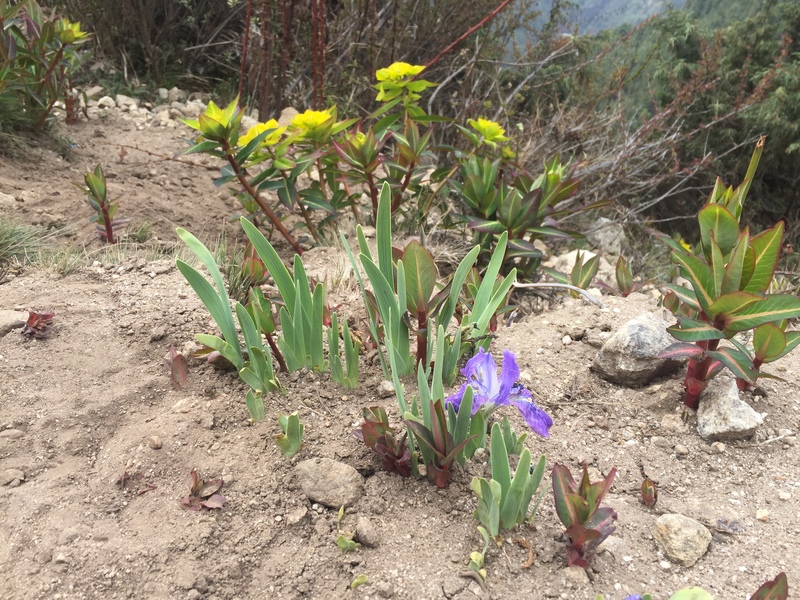 It was nearly all rhododendron forest – crimsons of all shades, steep snow-capped mountains, clouds, and blue skies. The rhododendrons were so bright you could see splashes of colors in the distant mountains like fall leaves. At one point we saw a musk deer, unusual for this area. They are hunted for their musk glands, and grow long canine teeth. It was a relatively short hike to Namche and we were back at the now familiar Himalayan Culture Home by lunch. It seemed warmer this time. In the afternoon we climbed a series of hills to the rather dilapidated National Park Museum (most notable for the Tenzing Sherpa statue) and the Sherpa Culture Museum. It is an odd place. Owned by a man who had lost his hearing to meningitis, didn’t go forward with his education and instead opened the museum. He’d hosted Sir Edmund Hillary in his later years. We were ushered into a dank and moldy basement where we sat on folding plastic chairs and watched a 20 minute slide show about Sherpa culture projected on the wall. 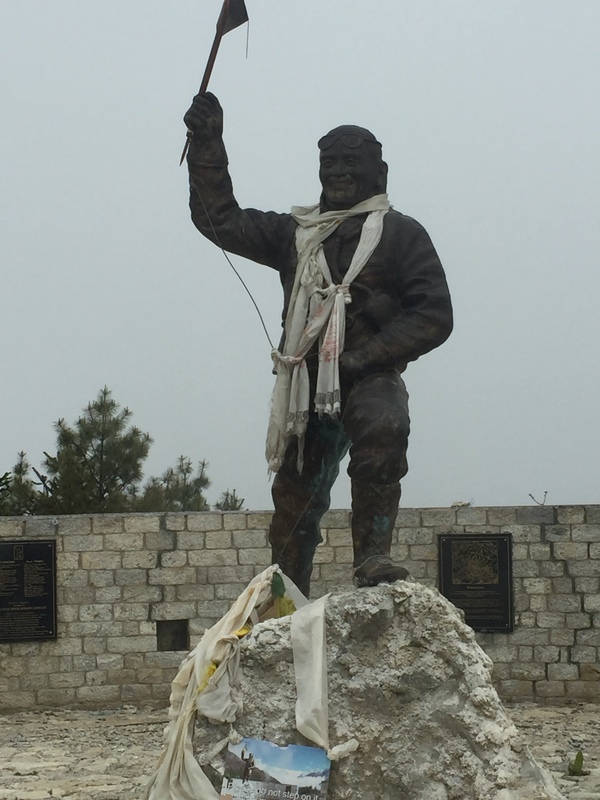 And the inspected the very impressive – but not updated – photos of every Sherpa Climber who had scaled Everest. We had an early night that night (not that any weren’t early). The next day we had to make it all the way to Lukla. On the way, this had taken us two days and now we had to do it in one. After two nights acclimatizing in Namche Bazaar, it was time for the march to continue. Sleep patterns were by now most peculiar – I found myself asleep by 9 pm, awakening at 1 am or so and reading, and then returning to sleep. I seemed to have reverted to the Middle Ages concept of first and second sleep. The day we left Namche was the day before Buddha’s Day. We walked clockwise (of course) around the monastery where prayers had already started and along the trail that we had looked down upon the day before. At first it was relatively flat, with some gradual ups and downs. After some time, we entered the Sagamurtha National Park and the altitude where the rhododendrons were still in bloom. Pink, white, red – forming an arcade over the trail. Another swinging bridge – I can feel myself start to sweat – and then time for lunch in a small cafe. The walls were covered in tapestry and all the food was prepared by two women over a wood burning stove. It felt as though we were in an old fashioned gypsy caravan. After, we were backed against a wall by one of the many yak trains coming through. This was S’s first of many encounters of the not good sort with a yak. A couple of hours of up through layered jagged mountains, overhanging fog, framed by rhododendrons. These mountains are new, geologically speaking, and a young world appeared around each bend in the trail. Light green trees interspersed with dark pines, creating a textures that clothed the mountains. We made it to the top in a respectable time, turned a corner, and suddenly we were at the Tengboche Monastery. Checked in to the Tashi Delek Lodge and then visited the monastery. Tengboche is centered around the very old monastery – there were a few tea houses for trekkers and a bakery, but we were now far away from the village culture we had previously experienced. It is bucolic. There’s an open meadow area where cows roam, the gate to the monastery and some low buildings where the monks live in numbered rooms, and a few grey stone tea houses. Six of the 12 resident monks sat in the center, chanting in a low drone. They spend their lives here, in very small rooms. 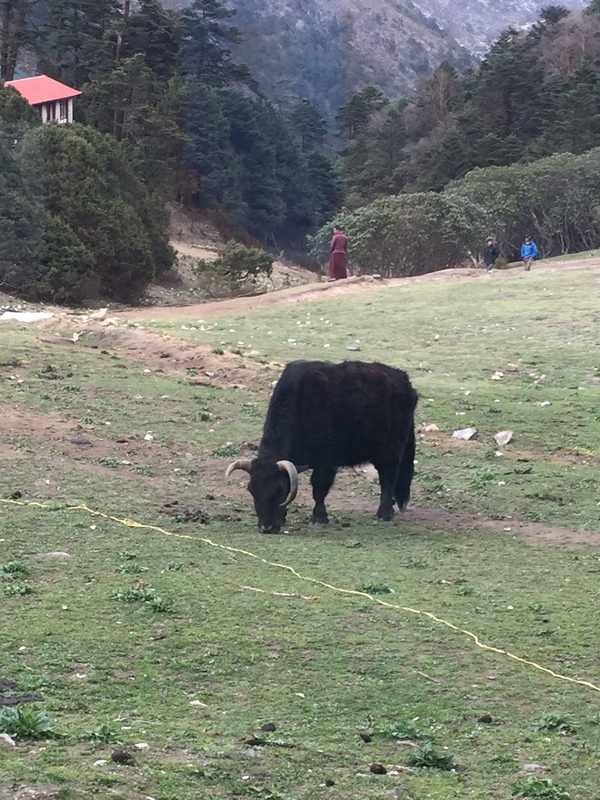 When we stayed at Tengboche on the return, we saw the younger ones going off to play soccer, crimson robes flapping in the wind. The fog rolled in, slowly covering the small dwellings. The next day we trekked to Dingboche, where we were to spend two more days acclimatizing to to over 14,000 feet. We could hear prayers chanted in each of the villages as we walked through. The wooded part of the trail soon opened up into a stony valley – the milky river below and some serious rock slides where I did not want to linger. Ultimately we ended up in Upper Pangboche. Most trekkers go through Lower Pangboche only, but it was clear that our guide wanted to make a special stop at the monastery for Buddha’s Day. This is a 400 year old structure, founded by a monk who allegedly flew there. Various people were coming in and out to pray for Buddha’s Day. Z lit a butter lamp, incense was burned, and he prostrated himself three times. A lay monk poured water in all of our cupped hands to drink and smoothe on our foreheads as an act of purification. He also showed us a niche in the wall of the monastery that housed a relic of the flying monk – a bone of some sort. Hiked on and on, including a stop for lunch, and then another couple of hours to Dingboche. Trail normally about 2 feet wide, sometimes with very steep drops on each side. Across the river the stones were white with splashes of red. We were above the tree line now. Small junipers, yaks, and a lot of helicopters making their way to base camp. in Dingboche we stayed at the Good Luck lodge. It was packed. We had a nice little room where the sun shone through the window and it was almost warm. The last few have been cold and damp. We are now at the point where yak dung provided the only fuel for the fire in the comunal dining area (which is never ignited before 5 pm). The middle of Dingboche is all privately owned potato fields – to get anywhere you have to walk three sides of a square. The next day we did an acclimatization hike to the Chukung Valley. We followed the milky river. A wide, stony expanse, with Ama Dablam peering at us from the right, Lhotse to our left, and Island Peak in solitary splendor straight ahead. We stopped at a cafe – and who was there but the guy from the plane. This time he explained that his seat hogging actions had been fueled by a few too many pints after he unexpectedly ran into a cousin at the Dubai airport. He and his friends were doing the three pass EBC route. There was a piercing wind on the way back and we went much faster. Once safely ensconced in Dingboche, J and I explored the village while M Andy S made friends with some fellow trekkers who were happy to share the very exotic salami they had brought from France. A nice change from gu’s! The dining room was packed because the rooms were so cold. We were now acclimatized to over 14,000 feet. Next up – two nights at over 16,000 feet – EBC itself and Kala Pattar! ALERT – photos will have to be uploaded later. I’m writing from Nepal – and am seriously wifi challenged at the moment! After we exited our flying tin can (also known as a Twin Otter) in Lukla and had a cup of tea, we immediately started uphill. 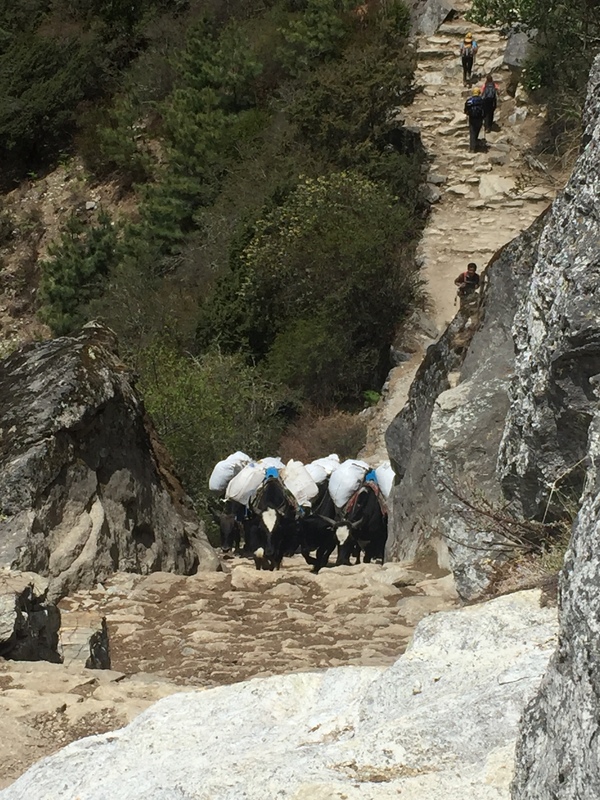 The first part of the EBC trek is nothing as much as a human highway connecting numerous small villages. There are no combustion vehicles of any types – no farm equipment, no cars, no trucks – and correspondingly, no roads. Instead there are yaks, gakyos (1/2 cow and 1/2 yak), and humans. Regardless of their size, they are all carrying huge packs. Yaks were carrying sacks of rice and blue containers of kerosene; one very small gentleman was carrying a load of rebar and another a full size freezer. Apparently the humans are paid by the amount of weight they are carrying. I have never seen such strong people – including at any gym I’ve ever been to. Each little village has at least a mani stone – a large rock painted with mantras, frequently om mani padme hum. (I read a translation today at the Sherpa Cultural Center that said it meant “hail to the jewel of the lotus,” but I’m not sure how much stock to put in that.) You pass to the left of the stone, always clockwise. Many villages have prayer wheels, ornate cylinders also engraved with prayers that you run your hand along, turning them always clockwise. Some prayer wheels are powered by water. Sometimes bells ring as they turn. A lot of places welcome you with a stupa. From the air it appears as a mandala. Generally, three terraces at the bottom represent the foundation of meditation. The dome is the womb of emptiness from which all comes. The box on top is painted with the eyes of the guardian Buddha. Some stupas, instead, have a statue of the Buddha in a glass enclosed niche. The 13 steps above represent the 10 levels of compassion and the 3 levels of tantric awareness. The umbrella is the sovereign sanctity of the Buddha mind and the crowning jewel in the top its wish fulfilling capacity. Buddhism is woven in to the fabric of everyday life here. On the return part of our trek I saw an old man sitting outside his tea house, running his fingers along his mala (a rosary of 108 beads) while spinning a handheld prayer wheel. His wife sat next to him, wearing the traditional long skirt with a woven apron on top, while their dog slept in the sun – all with the majestic mountains towering in the background. Most fantastic – that first day at least – was Gauri Ghat monastery. An elaborate structure in the middle of the area, multiple prayer wheels under shelters decorated with paintings of the Buddha. A feeling of serenity throughout. I had known before this trip that at some point I would encounter my nemesis – the swinging bridge of doom. It happened shortly after we left Lukla. For years my most frequent anxiety dream has involved a swinging bridge over a gorge where I can’t move forward or back. And that is exactly what I had to cross – following M’s white hiking shirt, feeling the bridge sway – at least 100 feet over the rapidly running river. I refused to look down or to the side (where I could tell the chain link fencing that formed the sides had been kicked out at the bottom, leaving a realistic possibility of slipping through). Saying mantras was a necessity. After three hours we reached Phak Ding and our first experience of tea house culture. The tea houses changed as we worked our way up to EBC and away from village into trekker culture. More on that later. 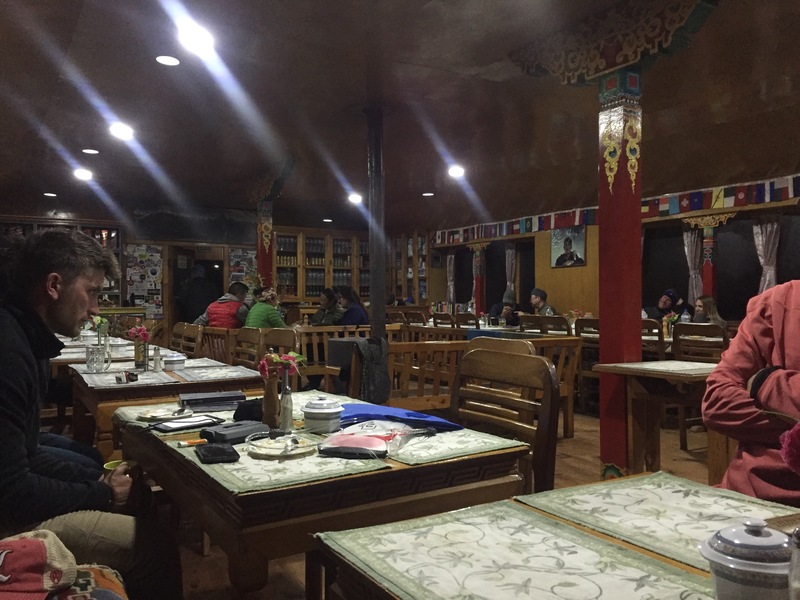 But typically there’s a dining room that serves as a communal living area, common toilets (although our first two tea houses had “en suite” toilets – little did we know what a luxury that was! ), and very cold small plywood pine rooms with twin beds, sheet and blanket, and if you were lucky, hooks and a light that would work after 6 pm. Ultimately we realized we needed to regard the rooms as a sophisticated version of a tent. After lunch, we took a steep acclimatization hike through a pine forest and small fields of potatoes and onions and spinach to a monastery that was being repaired. The monks were painting elaborate designs in geometric and representational patterns in colors for each of the five elements (iron being the one I didn’t know about). The paint contained a special resin to make it shine. We had to cross a second swinging bridge to get there – which made me no happier than the first – when who should appear but the guy who’d sat (slept) next to me on the plane. We recognized each other and exchanged pleasantries. Given my bitterness over the seat hogging, this was a fitting karma experience to accompany all the monasteries we had seen. And it’s not over yet. The next day we trekked to Namche Bazaar (originally Nauche) where we were to spend two nights. 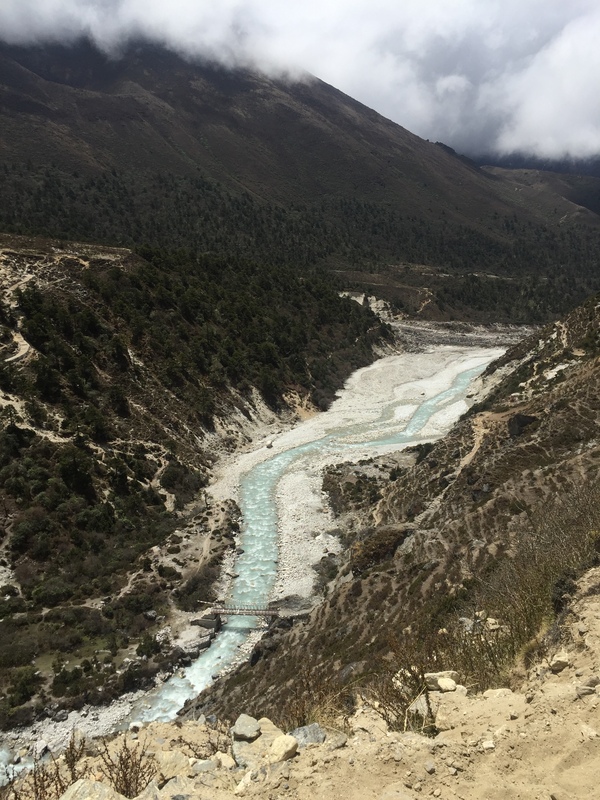 Much of the route was along the Milky River, a mint green blue rapidly running river that accompanied us most of the way to EBC. Today involved not two but five swinging bridges. Fortunately M continued to wear the white hiking shirt so I still had my driste to focus on. We had a lovely lunch by the river and the trail got progressively steeper. Fabulous views of the Three Sisters along the way. A yak herder following his yaks, while carrying his dog down the mountain. We reached NB suddenly. A pretty village of square stone buildings with a interesting mixture of trekker culture and village life. Trekking has been part of Nepalese life since the 1950s. What’s amazing is that every last thing has been carried here – by human or animal. 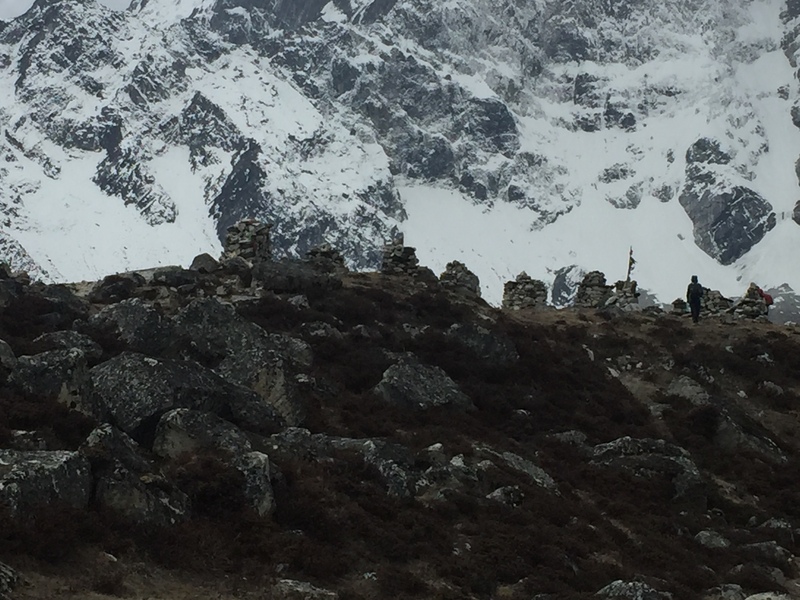 Namche does have a small airstrip for cargo, but even then – everything has to be moved several miles to the village. A very nice tea house with some beautiful woodwork in the dining room but COLD rooms. There was even a version of a shower with hot water (the last one we would see for days). Probably the prettiest tea house we stayed in. Unlike the very crowded places further along the route, we were the only people staying there. After we arrived, we went to the nearby monastery. A stupa is being rebuilt and the monks, all in crimson robes, were conducting four days of prayers to bless the items that will be placed in the stupa. Plus, day 4 is Buddha’s Day and there will be a big celebration. Because 12 monks were needed the prayers were occurring in the common area instead of the actual monastery itself. All of them sat in a row; the leader chanted in a deep sonorous voice and the others chimed in with various instruments- symbols, something that looked like a clarinet and bells. At one point plates of food were brought out as offerings – they would ultimately be left for the animals. There was a huge gold Buddha on one wall and a monk folding prayer shawls. We visited the upstairs museum, near the rooms in the upper galleries where the religious objects are taken care of. A monk asked us if we wanted to go to the actual monastery where the prayers normally occur. 300 years old, the walls were painted with images of Buddha. There was a shrine with statues of the past, present and future Buddha. Butter lamps lit, colors and patterns on every square inch, but a sense of peace emanating from the sensory overload. For dinner S and I tried yak curry, although I think it is usually buffalo. More of the local spinach, rice, potatoes, dal and apple pie for dessert (which was almost like an apple baklava). During our full day in NB, our acclimatization hike to the viewpoint at the Everest View Hotel allowed us our first view of Everest, Ama Dablam and Lhotse. We trekked gradually at first and then steeply up to about 12,600 feet, from pines to scrubby pines. Then down the other side of the valley to Kung Jung (sp) – tranquil, uncrowned, green rooves, and the home of the school founded by Sir Edmund Hillary. After poking around NB in the afternoon, we had Sherpa Stew for dinner. A thick broth with dumplings and potatoes, ginger, spinach and carrots. 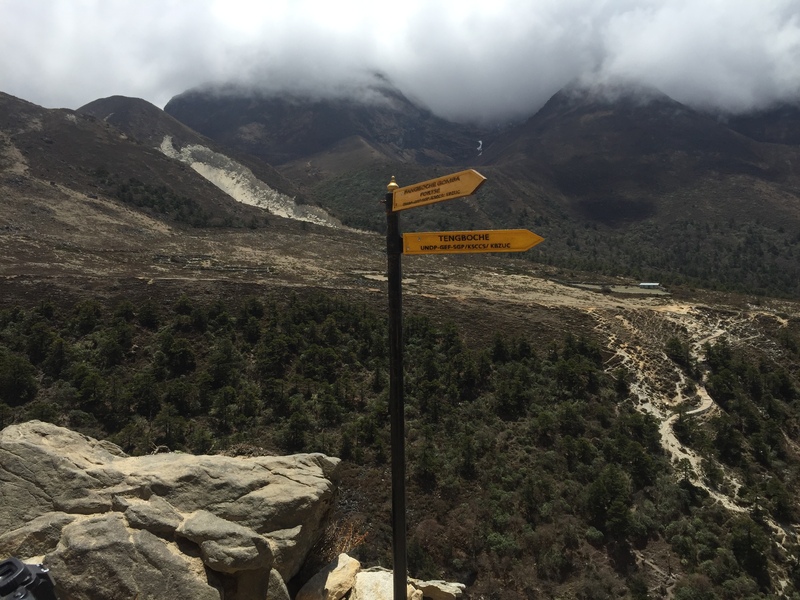 Next move – to Tengboche and Dingboche. I’m busy. I leave tomorrow. Everest. No photo in tbis blog. I’ve been too busy. I started this post with five days to go. And now I’m staying in the hotel at the airport in preparation for a 6 am flight, followed by 24 hours plus of traveling. I’ve faced my usual paranoia that the ridiculous hours I’ve been working in order to garner 2 1/2 weeks off will have so impeded my training I’ll find myself coughing as soon as I hit 10,000 feet, only to have a so far unexperienced asthma attack, get pulmonary edema, and expire somewhere at an unimpressive 12,000 feet. Matters have not been helped by the death of Ueli Steck a few days ago on Everest. One can’t help but wonder about the possibilities. But more important than the possibilities – however tantalizing they may be – at least for those of us who have some great need for adrenaline – is figuring out why you’re going up the damn mountain in the first place. The busyness – business of our lives has taken over. I don’t know about you, but if one more person asks me to do one more thing, I might just combust. I’m called upon every hour multiple times per hour to make decisions. Some small; some large. Whether my recommendation affects one or thousands – you know what? It’s just as important if it affects one person’s working life as it is if it affects many. Jobs are important to people. Back to topic. I’ve been training for this trek since we came down from the last. And I really, really need to get away from that busyness – business. I’m hoping that somewhere in Nepal, on the way to Everest, there’s some fabulous lost horizon that’s going to give that sense of peace. It’s 18 days or so until we depart for Nepal, and the effort of training while holding down an intense work schedule has wreaked havoc with my blog. But I’m determined to finish up writing about our now four year old adventures in Arizona – because next up is a new and exciting continent…a new frontier. But back to Arizona and our journey through time. I had always had a vision of Sedona as a mystical place that would provide a portal into an alternate universe, the age of Aquarius, or some such place or time. I have never forgotten going to take a deposition in Scottsdale, very close to Sedona, where I managed to stay for less than 24 hours in order to return to my very young children while opposing counsel stayed an extra day so he could go hiking in Sedona. Ever since then I knew something had to be waiting for me there. So you can imagine my disappointment when we drove our trusty rental car down the main street to find a swarm of timeshares and souvenir shops, albeit ones selling crystals. Our small hotel was right on the Main Street, and supposedly featured a fireplace and mountain view – which it did but only if you looked out the back window over an alley. No matter. We weren’t there for the town but the hiking. I don’t recall the exact time frame – I believe we arrived in early morning and went hiking that afternoon. A friendly and talkative chap at the tourist information center suggested a hike on the Bell Rock Trail around the Courthouse Butte. I checked the brochures and found that indeed it was supposed to travel through the energy vortexes for which Sedona is famous. Not quite sure what an energy vortex was, but it certainly seemed like something one should experience. Plus the idea of the Courthouse Butte seemed particularly appropriate for someone of my vocation. The landscape stood in sharp contrast to the greens and blues and greys of the Grand Canyon. Here a uniform peach and tan dusty sheen bathed everything. We were well into hiking mode and found it easy going except for one small matter – direction. After a couple of hours we realized we were hopelessly turned around. Whether it was the energy vortex or our own poor navigational skills I don’t know, but we went this way and that, with very little idea which way would bring us back to the trailhead and our car. The dusty trail looked pretty much the same everywhere and the Courthouse Butte itself – which originally looked like a square stone formation with four sides – suddenly seemed to veer off into multiple random directions. Ultimately we resorted to my iPhone for some navigational advice – after we had realized that the parking lot we saw in the distance wasn’t ours but one at the opposite end of the park area. It couldn’t have been more different than the Canyon. There – there was a clear up, down, along the side and across. It was linear and direct. It was down into time and back out. But Sedona was a grand circle that spiraled and turned and tricked you into a trail here or there with any number of unexpected outcomes. I wouldn’t have had one without the other. I’m going to rush through our time travels in the Grand Canyon because I’m eager to get to the last part of our story from four years ago (almost to the day) – and that’s Sedona. By the way, the time theme really didn’t come from Outlanders – despite the fact I’m now on Book 6 and know more about 18th century medicine than I ever thought I would, not to mention the battles of the American Revolution. But I digress. When we last parted, J and I had survived an icy horseback ride in Flagstaff and had made it down to the Colorado relatively unscathed. After an easy night camping at Phantom Ranch, and encountering various Canyon dwellers who seemed on a perpetual hike through the Canyon, it was time to head back up. We started with a couple of nice flat miles along the banks of the Colorado, stopping by some sandy beaches where we could touch the eerily turquoise water. Finally we turned upwards, each step taking us further away from the prehistory of the deep inner Canyon walls. We hiked switchbacks up the Bright Angel Trail until we arrived at Indian River campground, about halfway to the top. Have I mentioned that the Grand Canyon has the most excellent toilet facilities of any outdoor area I have ever seen? Clean, eco friendly, non-smelly composting toilets. If you have followed this blog and have seen the facilities at Mt. Elbrus in the Caucasus Mountains of Russia – or possibly worse – Pico de Orizaba in Mexico, you’ll know what I mean. Pic0 de Orizaba is on the left below; Mt. Elbrus on the right with the barrels we stayed in just behind. And no, the black rectangle is not a shadow – it’s no door. At sunset that night we hiked to a plateau overlooking the Canyon for dinner, where our talented guide managed to cook over a stove no bigger than a can of peas. The stone formations cast shadows and the only thing marring the effect is that we weren’t the only ones there. Hiking back to our tents in the dark was an interesting experience but none of us tumbled off the steep ledge. The next day we hiked the remainder of the trek up. It was icy and we were just ahead of a storm. I was quite happy to put on the micro spikes our guide had stored in his pack. As we crossed the Tonto we met an elderly couple who were spending ten days hiking the Hermits Trail and others equally remote. Weatherbeaten and dusty, they apparently did a trip like this every year. They seemed like excellent role models. But all good things end, and before lunch we were back at the top and in the 21st century – where a ream of emails flooded our phones, anxiously awaiting our reading. After a lunch of junk food – never did it taste so good- we made our way back to Flagstaff – where dinner at a cozy craft brewery completed this portion of the trip. And then? After the time machine travel of the Canyon, there could only be one place to go – into the vortex. Sedona is next. We awakened early for the drive to the Canyon. The details are blurry but I remember it was quite cold, and after we parked, we had to take a shuttle bus to the beginning of the trail. It was clear from the outset that most people were venturing down only for a quick peek over the edge and very few were as laden down as we. In fact, a number of people asked us if we were planning to move there. Our route took us down the South Kaibab trail to the river in one day. Once at the bottom we would camp at Phantom Ranch – in the campground; no cabins or hostel for us! The next day we were to go half way up the Bright Angel trail, camp at Indian Gardens and then hike the rest of the way up and out. Soon into the trip it became apparent that we’d found the one type of terrain where my relatively short stature was a benefit. With a center of gravity a lot lower to the ground than the two over six foot males behind me, I discovered that I was able to practically jog along the switchbacks without losing my balance. In fact, for the first and one of the only times in my hiking career I kept having to stop and wait for the others. The beginning of the hike was quite populated. There were bus loads of high school kids, many from abroad, swinging cameras and trying to hike in wildly inappropriate footwear. Apparently the packing list hadn’t included a section on outdoor gear. It was actually terrifying to watch some of them teeter and totter next to what was a pretty steep tumble to the bottom. The journey down was a trip back in time. Starting with streaks of tan sandstone, moving down toward strips of an almost turquoise. Cell phone coverage soon (and thankfully) ceased. And as we went lower and lower there were far fewer people – although now and then we did have to move over to let the famous mule trains pass. About half way down there is a trail called the Tonto that runs along the side of the canyon. It’s like a green stripe running horizontally and I’ve wanted to hike it ever since I saw it. And when you get below that you can start to hear and see the Colorado. It’s a ghostly shade of blue green due to the effects of various dams. The rocks shift toward black, almost like marble, and you feel as though you have returned to the bowels of the earth. The campground at Phantom Ranch was populated with a number of odd characters, some of whom seemed to spend their entire lives just hiking around the canyon. There’s a complex of cabins, a hostel of a type, and a shop where you can buy a postcard or a beer. We hiked up the other side of the canyon for just a bit. The sun cast long shadows off of the black stone. As the sun set into the depths of the canyon, it took with it all the trappings of our 21st century lives, leaving us only with a pitch black cover of night, punctuated by the light of millions of stars.